Kindergarten is a full day program that cultivates developmental and academic skills. There is a balance of classroom activities which further social, emotional, intellectual, physical and spiritual growth. The curriculum encourages a learning environment with children interacting with each other while participating in hands-on, interactive learning. Each Kindergarten student has the opportunity to learn through technology. Learning Centers, including one-on-one teacher time, involve reading and math instruction. They are introduced handwriting methods for cursive and manuscript. Students learn basic sight words, vowels and phonics rules to encourage their emerging reading development. Math introduces number sense, addition and subtraction with manipulative, coin recognition and value, non-standard and standard units of measure, telling time and counting. Inquiry-based learning offers students the opportunity to observe and explore as experiences with Science and Social Studies are taught through thematic units. Kindergarten classes participate in chapel daily. In addition to chapel, students have Bible class and integrate biblical teachings in all curriculum areas. The students have opportunities for physical activity, Spanish and music instruction. The First Grade provides an academic program to ready the students for lifelong learning. The students are given the opportunity to achieve academically and to begin developing a Christian character. Focus is on life-principles such as self-discipline, truthfulness, self-motivation, determination, forgiveness, and honesty. A first grader learns new skills to better help them read and assimilate their growing knowledge. The emphasis in first grade is on phonic-based reading and math. The math curriculum integrates common core problem-solving methods developing into strong computation based skills. Students participate in chapel daily. In addition to chapel, students have Bible class and integrate biblical teachings in all curriculum areas. Their schedule also includes physical education, music, art and Spanish. The Second and Third Grade at CFCA provides academic programs to ready students for the upper elementary curriculum. Students learn new academic skills and continue to develop a Christian character. CFCA educates academically, socially, emotionally and spiritually to produce well-adjusted students who cultivate the habit of excellence. The second and third grade year is one of mastery in reading and comprehension addition/subtraction math facts; learning number sense and critical thinking skills defined by common core is an essential element in the second and third grade curriculum. Students participate in chapel daily and Bible is integrated in the curriculum. The core curriculum includes Math, Reading, and Language Arts. Additionally, Science and Social Studies are incorporated into the curriculum with inquiry-based and hands-on learning activities. The schedule includes physical education, music, art and Spanish. The positive environment of Fourth and Fifth Grade classes encourages students to believe in themselves. With this environment, goals may be reached spiritually, socially, physically, and academically. Students begin to understand what it is to have a personal relationship with God. They start to realize the meaning of sacrifice—especially God’s sacrifice in Jesus and they begin to be proud of the unique way God created them. Students are introduced to concepts that build on prior knowledge, integrating vocabulary mastery, reading, comprehension, and common core solving tools. The middle school program for grades 6-7 is designed to solidify the educational foundation of the elementary education while preparing students for the rigor of an excellent, college-preparatory high school academic program. Community outreach projects, fine arts, technology integration and sports are all designed for students to investigate their God given gifts, talents and interests. 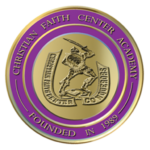 We expect Christian Faith Center Academy to produce students of Christian character to impact our world through. © 2018 Christian Faith Center Academy. All Right Reserved. Website Developed by Graphix Ink.